In 2005, Congress established a number of energy-efficiency tax incentives related to housing that benefitted new home buyers and remodeling homeowners. These policies included the tax code section 45L credit for the construction of energy-efficient homes (including for-rent residences and low-rise apartments), the 25C credit for retrofitting/remodeling existing homes, and the 25D credit for the installation of power production property in new and existing homes. 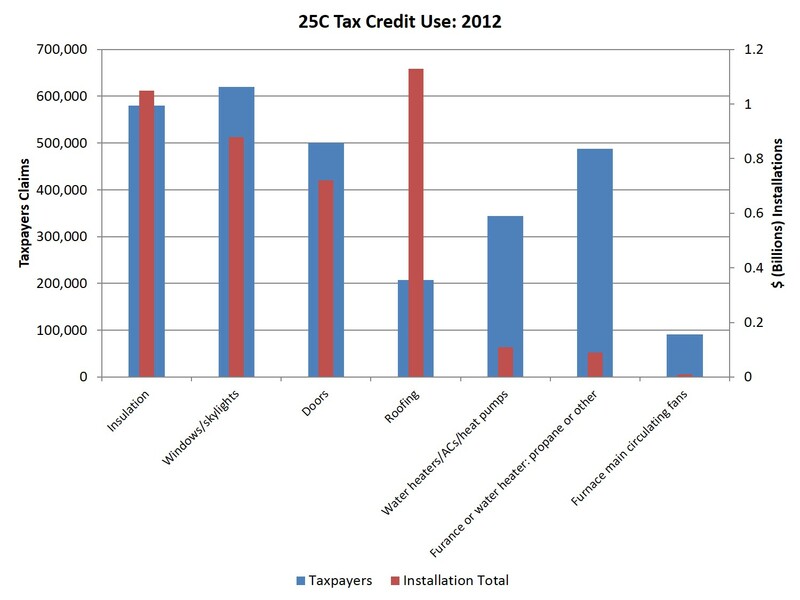 Using prior IRS data, we were able to examine total credit claims for the 25C and 25D credits in 2012. That data indicated declining use for the two credits in combination, but did not allow a breakout of use for each individual credit. According to that prior NAHB analysis, total claims of the credits summed to $5.8 billion in 2009 and rose to $6.1 billion in 2010, before falling to $1.7 billion in 2011 and finally to $1.3 billion in 2012. Much of this decline was due to reduced use of 25C, as explained below. Over the period of 2009 through 2012, more than 90% of all taxpayers claiming either credit had adjusted gross incomes (AGI) of less than $200,000 (93% for 2009 through 2011 and 91% in 2012). The declining use of the 25C credit can be traced to recent rules changes. From 2009 through the end of 2010, the 25C credit for existing homes was available as a 30% credit and $1,500 limit. After the extension of the “tax extenders” legislation at the end of 2010, those rules were pared back and retained when the credit was extended again as part of the Fiscal Cliff deal. Among those rule changes, the credit was reduced to a 10% rate and a $500 lifetime cap was imposed. It is worth noting that this version of the credit was extended for 2014 but has once again expired and awaits Congressional action for possible 2015 claims. The 25D credit is scheduled to remain in law through the end of 2016. 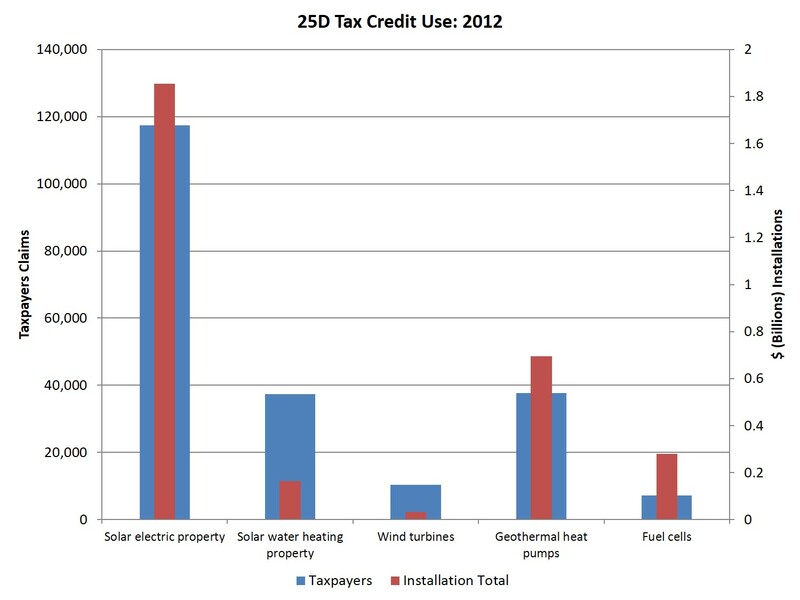 New data from the IRS for tax year 2012 (the most recent available) reveal how taxpayers are using these residential energy credits, with breakouts for 25C and 25D respectively. As in prior years, windows were the most common means for using the 25C credit, although the data indicate a significant jump in the dollar value of credit claims for energy-efficient roof improvements. 619,000 taxpayers claimed a 25C credit via window upgrades connected to a total dollar value of $880 million of improvements. In contrast, 207,000 taxpayers claimed $1.1 billion of work for energy-efficient roof upgrades. Comparing the 2012 data to 2011, all categories of improvements experienced declines led by window upgrades, which fell $820 million for qualified improvements. For 2012, a total of $3.99 billion of energy-efficient upgrades was claimed for credit calculation purposes on tax forms filed by just under 2 million taxpayers, yielding a total credit amount of $450 million (inclusive of carryforwards and the $500 lifetime cap). The story for 25D is different, with flat total claims but rising totals for some types of energy improvements. By far, the most commonly claimed qualifying activity for the 25D credit in 2012 was for solar electric property, with more than 117,000 taxpayers claiming the credit for a total of almost $1.9 billion in qualifying costs of installation. The second most common installation in 2012 was for geothermal heat pumps, which was claimed by more than 37,000 homeowners and a total of almost $700 million in installation costs. From 2011 to 2012, claims associated with solar electric power grew by more than 11,000 taxpayers and $367 million. Tax credits for fuel cells also grew from 2011 to 2012. The other categories experienced declines, particularly for geothermal heat pumps, which declined by 33,000 homeowners and over $500 million in claimed costs from 2011 to 2012. In total for the 25D credit, almost 265,000 taxpayers claimed a 25D credit (124,000 due to carryforwards of unclaimed credits from 2011). In total, there was more than $3 billion in qualified installations made in connection with 25D in 2012 yielding a credit total of just under $900 million. Despite the changes associated with their use, the tax credits have been claimed in connection with billions of dollars of energy-efficient upgrades and new home features.